Ideal for drawing, illustrating, and coloring, these richly colored pencils feature brilliantly balanced shades for superior blending. Long lasting, thick 3.8 mm leads are encased in round, lacquered California cedar casings. For easy identification, the exterior of each pencil is colored to match the core and the color name is printed on both ends. 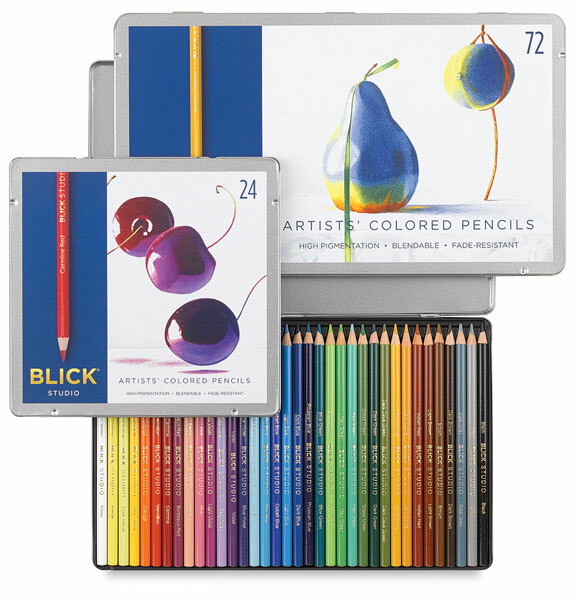 Blick Artists’ Colored Pencils were specially developed utilizing feedback from Colored Pencil Society of America (CPSA) artist members and teachers. The result is a professional-quality colored pencil at an affordable price that has been manufactured to Blick’s exacting standards. 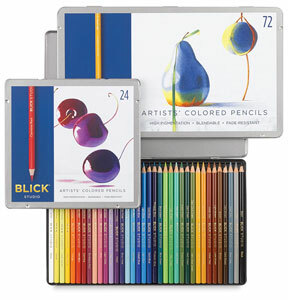 Use Blick Studio Artists’ Colored Pencils for fine art applications or wherever you need some color. Order Fulfillment Note- Your order will be fulfilled with either Blick Studio Artists’ Colored Pencils or Utrecht Premium Colored Pencils. Manufactured in the same European factory, both of these high-quality colored pencils feature the same soft, highly pigmented cores encased in natural cedar casings, for smooth laydown and coverage. Colorless Blender — Use this colorless blender pencil with Blick Studio Artists' Pencils to lighten colors, blend overlapping colors, and soften hard edges without cloudy buildup or adding additional color. The natural wood barrel has a clear polyurethane coating. To view a PDF of all Blick Pencils, please click here. At Blick we pride ourselves on providing artist quality drawing materials at the most competitive price. See why our Blick brand Studio Artists' Colored Pencils, Studio Markers and Artists' Soft Pastels are an excellent choice for fine artists - even those on a budget.